Find out about the benefits that your research can bring to your company in the recruitment process. The recruitment process is a chance for the company not only to expand the team with a valuable employee. This is a great opportunity to get the information you need to create a positive image. The standard is already conducting customer and employee satisfaction surveys. However, it is worth going a step further - use the recruitment process to obtain additional information. 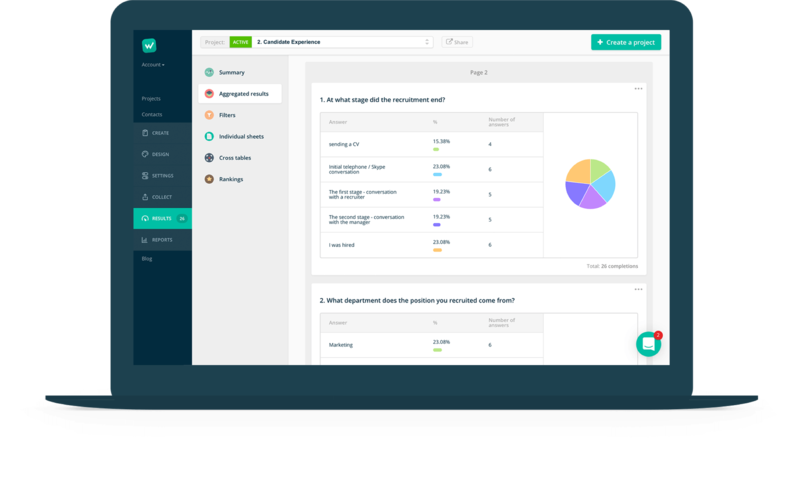 Candidate Experience research is a simple tool that allows you not only to learn about the progress of the recruitment process. Thanks to their results, the company will learn how to attract the most qualified candidates, how to improve its course and which of the individual stages are evaluated negatively or positively. Who to invite to complete the survey? The answer is simple - candidates applying for employment in our company. To be reliable, it should be directed to all persons, both employed and rejected at various stages of recruitment. The more people surveyed the better - an effective way to get results from a large number of respondents is to attach a link to the feedback survey with the recruitment results. When to conduct the survey? The timing of the Candidate Experience is critical. It should be taken into account that the answers given before knowledge of the recruitment results may not be completely honest. As the best moment is assessed the time after a few days from the respondent familiarizing with the results of recruitment. The opinion is then more balanced, devoid of emotions resulting from rejection or acceptance into the position. Net Promoter Score uses a rating scale from 0 to 10, where 0 - definitely not recommend and 10 - definitely recommend. Based on the answers provided, candidates will be assigned to three groups: decrators (score from 0 to 6), group of passives (from 7 to 8) and promoters (scores 9 and 10). The key is knowing about who belongs to the group of critics and who to the promoters. It helps to develop an effective strategy for further action, and consequently to change the negative attitude of critics and maintain a high level of satisfaction of promoters. And this is the strength of the NPS. 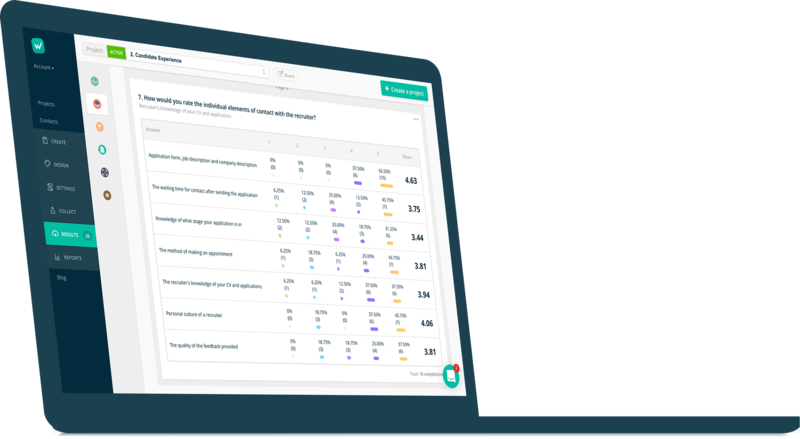 By using our platform, you do not have to worry about creating a Net Promoter question and calculating results. Simply select the NPS question from the list of questions or use a ready-made example. The result of the survey with this question will be updated live in aggregate results and reports. How else can we research candidates? which will help you understand Why is it happening this way, not different? defining the scale of feelings for a given phenomenon, e.g. 1- I didn't like it, 5- I liked it a lot. They let you get information: What affects such and not another answer? which says Where to look for problems? (helpful in analysis). To what extent do you think the job description included in the overlapped work offer with information provided during the recruitment meeting? How friendly/helpful were the recruiters? To what extent were explanations of the scope of duties and tasks which should be performed during recruitment understandable? How fast was the recruitment result known to you? To what extent the recruitment process needs to be changed/improved? Answers to the questions should be given on a 5-point scale, eg in the first question 1 - it didn't overlap at all, 5 - fully overlapped; in the fifth question 1 - completely requires, 5 - doesn't require improvement/change at all, etc. Information that the candidate will be asked to fill in the questionnaire should be given already during recruitment - otherwise rejected people may consider a message from the company as spam or simply ignore it. It is worth to place the information about the purpose of the survey. Once conducted the research is not enough - it's best to do it regularly, especially after introducing changes to the recruitment processes, based on the results obtained in surveys. Candidate Experience should provide respondents with anonymity. Why is the Candidate Experience worthwhile? Information is the company's biggest weapon. Having reliable data, we can eliminate errors and develop areas that bring us the most positive feedback. And more specifically? First of all - even negative results are important information. Why? Unhappy candidates will share their experiences with others. This will contribute to creating a bad image of the entire brand - no recommendation to friends, reduced sales, etc. Badly recruited takes also valuable time and generates unnecessary costs. Secondly, positive feedback is something that you can boast about (publish it on the website, inform in newsletters). Thirdly, candidates like to be asked for feedback - they appreciate when the company is interested in their opinion. Thanks to this, you can easily gain an advantage over your competitors -only 16.7% of enterprises have knowledge about the factors that motivate candidates to apply. Get ahead of competitors - ask! 83% of candidates say that the negative impression of recruitment can change their way of thinking about the company - even if they had positive feelings about it before. People who have received information about recruitment results are willing to re-apply to the same company 3.5 times more often than those who were left without feedback. 72% of people with negative impressions from the recruitment process declare that they will share them on websites and portals devoted to job searching. Without receiving a response from a potential employer to85% of candidates assume that the computer program, not the person, is making the selection of applicants (which may be reflected in the decrease of confidence in the company). Only 46% of employers regularly improve their recruitment process based on information from the candidates' surveys. You don't have to be part of this group - stay ahead of your competitors and start the Candidate Experience research.